Interest in ‘Mindfulness’ is growing rapidly worldwide and the editorial team at Flow Magazine understands why. This issue focuses on 19 Days of Mindfulness. 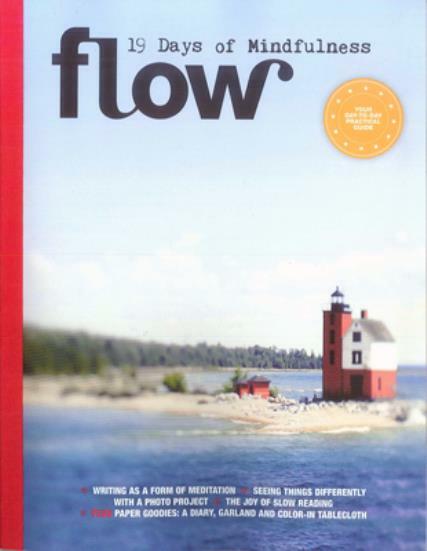 Buy a single copy or subscription to Flow Mindfulness magazine. It is such a wonderful solution for so many of the troubles everyone faces in this busy life. MINDFULNESS is just about living your life with your eyes wide open. Looking at what’s happening right now. Enjoying the ordinary things and small pleasures that life brings and learning to worry less. Stories about self-compassion, mindful running, new ways to deal with anger, fear & jealousy. Paper goodies: ‘One Thought a Day’ notebook, postcards, and a booklet on the joy of doing one thing at a time.